A stiff and adventurous climb along the slip-prone track to the open hilltops of the Ruahines - with the reward of views across lower North Island and beyond. We’ve joined up with our son and his partner, Matt and Sim respectively, and their collie-hunterway cross, Little Dog (or LD for short), for a few days of walking in the Western Ruahines. With three dog permits from the local DoC office in our pockets, we’re looking forward to some good walking, under Matt’s leadership. 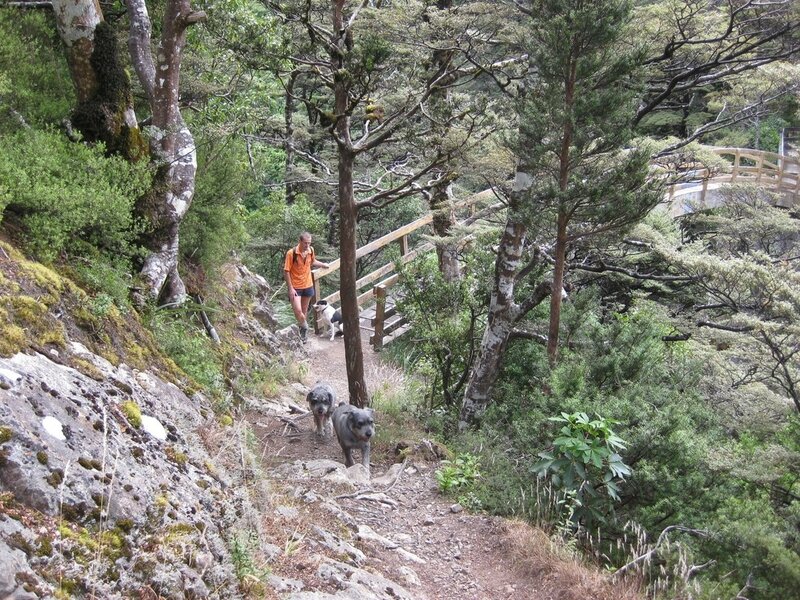 For the first walk, he’s chosen the Rangiwahia Hut trail. It offers, he tells us, access to the open land above the bush, and some fantastic views. But it’ll take, he says, a bit of stiff walking, because there’s a large area of slip to detour. We make it safely, and head off. For a while, it’s an easy and pleasant stroll along a well-graded path – first gravel, then leaf-covered soil – through a lovely stand of mountain beech. Work has started on upgrading the path, and in places there are piles of gravel, and after twenty minutes or so we see our future: a new and unfinished section of path branching off to the right. Until that opens, however, our route is straight on. For five to ten minutes the going remains relatively easy; the path is narrow but well-graded section. But then we reach the slip. We know when this happens not only because the terrain starts to get a bit rougher and the vegetation shrinks to smaller, secondary-growth woodland, that's obviously struggling against the elements, but because a board with a fleet of arrows suddenly sends us on the detour, right, and uphill. For the next three-quarters of an hour or so, it’s something of a slog. For the first half of this, we scramble up a loose and rather slippery slope, hauling ourselves occasionally over large tree roots or bouldery scree, at times giving the dogs a helping push of the bum to get them up an obstacle, sometimes being lured into a sense of relief by a short level section, or a quick downhill dive. Then, when we are just beginning to think that it’s all at an end and have stopped for a well-earned breather and swig of water, there’s another uphill stretch that seems as bad as anything we’ve yet met. But at last, the path curves to the left, the terrain levels out, and once more we’re walking along a flat and pleasant, leafy track. For all of fifty metres. Then, of course, the principle of 'what goes up must come down' takes effect, and we start to descend the other side of the slip. As we might expect, this is the reverse of the way up: a windy, up-and-over, down-and-round scramble and slide between the roots and rocks. And as on the way up, it goes on for just a little longer than we think possible. But then the path again levels out, swings right, and quite soon we’re walking along a better surface, with only the occasional obstacle to break our stride. And soon after that, the track heads down to an impressive arching bridge. While Mozzy and Little Dog trot across happily, Midge watches, clearly doing a full and careful risk assessment – and not liking the result. But with a gentle nudge and an encouraging word, he follows and we all cross, with only a slightly nervous glance to the river thirty metres below. On the other side, it’s comparatively easy going again. The path runs along a soft-floored spur of land, then swings left and angles steadily up the slope. To be sure we sometimes have to negotiate a large tree root or scramble up a short rocky face, but we’re getting good at that by now. Soon, we pass a small seasonal waterfall, at the base of which there’s a welcome plunge-pool where the dogs can paddle and drink, then we swing left again, upslope. After a short steep section, we edge round the back of another, much smaller small slip* and then it’s a final easy climb on soft peaty soil for five minutes or so, until we come out onto the tussock grass and onto the ridge. There, down below us, fifty metres away and about two and a half hours after we set out, is the hut. We head down for lunch on the veranda and add our names in the visitors’ book, delighted to find that five of our namesake have visited the hut in the previous four months (two of whom live in the same town as our son). Then, replenished, we follow the track for 50 metres or so to the summit, where we sit on the bench and admire the views. Northwards we can see the lower slopes of Ruapehu, westwards the cone of Mount Taranaki rising above its skirt of cloud. On a good day, Matt tells us, we’d see south as far as South Island. It’s a lovely view, and without doubt makes the whole walk worthwhile. Even though we know that the return trip still beckons! Though to be fair, that’s not only quicker (a little under two hours) but also easier than the walk up. The downhill section round the slip makes our knees wobble and our calves turn to jelly, but the upward part is almost welcome in amongst so much down. And the last part of the walk, down through the beech trees, feels like a gentle afternoon stroll, as we think back on what we’ve done, and look forward to a long shower back at home. Note: At the time of writing this (March 1023), the track is in the process of some serious upgrading, partly to realign the track around the main slip. When that’s done, it’s likely to be a much easier walk. For the moment, though, it involves quite a bit of a scrambling at various points, especially on the detour around the slip, and one needs to be at least in a moderate state of fitness to attempt it. Though the whole walk is only 4 km each way, therefore, it’s likely to take the best part of four hours for the return, including a lunch stop at the top. Status: off leash (under control). Permit required - free from DoC office in Wellington.